All Jakob ever wanted was to fulfill his family’s wishes and become a powerful Doctrine Codifier. A son who would bring continued honor to their esteemed name. Everything seemed to begoing to plan when he gained admission to the prestigious Catermane Academy. Then he met Valeria and Veronica, polar opposites in everything they do. Valeria lusts for action, adventure and the easy way out, while Veronica, with practiced calm, remains serious minded and studious. Despite their differing personalities, the two best friends are united in their shared infatuation of Jakob. Unfortunately, neither has ever been particularly good at sharing. Their constant attempts to win his attention and affection invariably lead them from bad situation to worse. It is to the faculty’s great relief when their antics lead them off planet. At least then the academy will be spared yet another cleanup bill. In truth, it is remarkable that the trio manage to learn magic at all. 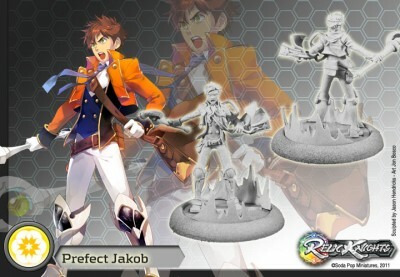 Jakob and two other LE miniatures are available on the CMON shop now!